Nervous System is a company we have loved from afar for a while now. Their work in in the field of computer generated design is uniquely beautiful and mind-blowingly clever. Nervous System’s novel computer simulation processes draw inspiration from natural forms and patterns to create designs that are perfectly suited to digital fabrication. Recently they released their Kinematics system. This amazing programme takes any three-dimensional shape and turns it into a flexible structure using hundreds of interlocking shapes. Pretty cool huh? What is even cooler is that the system allows the object to be generated scrunched up ready to be unfurled once it has finished printing. Therefore objects usually much too large for a printer’s build platform can be created. As a part of Kinematics, Nervous System have released Kinematics @ Home. This is an online interactive customisation tool that allows you to customise a bracelet design. By dragging its edges you can shape it. Drag the centre to morph the pattern. Clicking on individual cells allows you to toggle from hollow to solid. 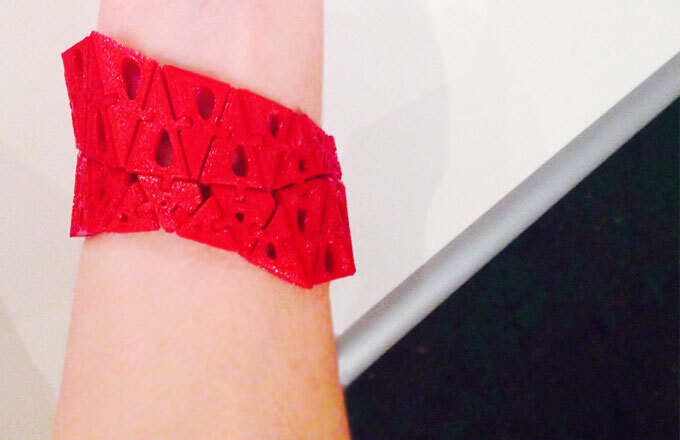 Once you are happy with your bracelet you can downloaded it as an .STL file to print at home. We couldn’t resist a go. The process was easy and went from website to printer within 15 minutes. The result was stunning! The print (done in Mercury Red) worked first time and is probably one of the most spectacular pieces of jewellery we’ve taken off the build plate so far. Thank you Nervous System. You rock!